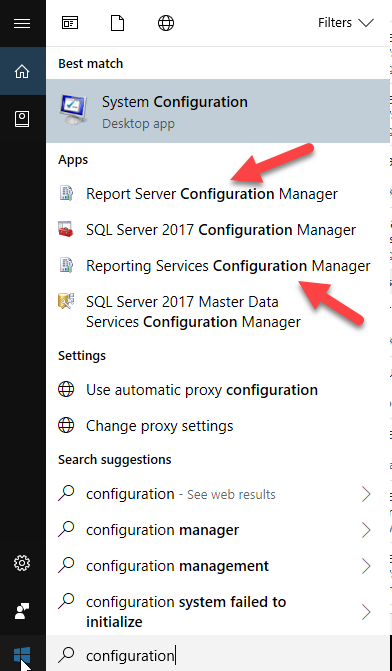 I just spent ages trying to work out why I couldn't connect to Power BI Report Server using the Reporting Services Configuration Manager. Amazingly, I hadn't had to reconfigure it since I installed it, but now I needed to change the email account. And it just wouldn't see that it existed. If I put MACHINENAME only, it told me it couldn't find the server, and if I put MACHINENAME\PBIRS, it said it was an invalid namespace. as you can see from the screenshot above that I got by searching for just "configuration". Using the second option worked just fine. I experienced the same and had to run the "PowerBI Report Server installation" to get the the "Report Server Configuration Manager".